Home paranormal beliefs Ghost And Spirit Belief In Thailand . Ghost And Spirit Belief In Thailand . Thailand’s Spirit and Ghost Beliefs Thailand is Buddhist but they also have an animistic belief in ghosts. This belief is a hold over from before Buddhist times. So their Buddhism is mixed with a spirit based religion. If you have visited Thailand you probably have noticed little toy houses near most of the buildings. I have a friend who inquired about the significance of these little houses. He found most of the Thai people would not discuss their Buddhist ghost beliefs with him. It is a closely guarded secret. The Thai feel that spirits are everywhere; they feel strongly that some spirits can even cause trouble. Because of this belief they feel it is important to appease these spirits so they can live their lives in peace. One way they do this is by building or having a little home built for these spirits. Every day the Thai people make offerings to these spirits by leaving water, food, candles, incense, and flowers for them. They feel this pleases the spirits and at the same time keeps them away. The Thai also believe that not all spirits are bad. They believe that some spirits if they are pleased and treated with respect will help the living by keeping angry ghosts and unwanted intruders away. They also feel these good spirits can help keep them healthy. 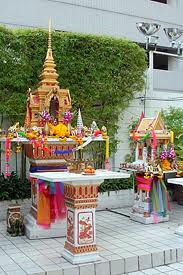 These spirit houses are not only outside Thai homes they are often placed outside hotels, hospitals, and office buildings. They can be seen throughout Thailand. They are placed on a post that is at eye-level or slightly higher. When a new house is built the average Thai has a Brahmin priest find the best location for their spirit house in their garden. These houses are always placed facing north or south--north preferably. The Thai people before improving their own homes will improve and enlarge their spirit houses. The Thai routinely pray or ask these spirits for better jobs, greater wealth, good relationships, and protection. They feel as long as they treat them with respect the spirits will be good to them. In the same vein they feel if a person ignores these spirits they better be on their guard. Most Thai people in general fear ghosts because of the ghost stories that their parents told them when they were little in order to keep them away from certain places. In Thailand spirits are considered higher in rank than ghosts. They belief ghosts can do horrible things to you: they can make you lose your money, or even your wife. They also can make you sick and even physically accost you. The Thai believe that when a stranger comes to stay at their home this visitor must first ask permission and protection from the spirit in their spirit house. The homeowner then rewards the spirit for doing them this favor by offering them duck, chicken or a large coconut. If this is not done it is believed their visitor will have really bad dreams and the evil spirit "Phee" will sit on their chest making it hard for them to breathe. Many Thai say they have seen these ghosts and the Thai media often report on these sightings. Again people from Thailand do not like talking about this but they feel in essence that a war is going on between spirits and ghosts. When questioned about this they evade answering. Despite this it is well known that every village has what they call a “spirit specialist” who looks for just the right spots to place spirit houses. This specialist conducts a ceremony where he chants the proper mantras in order to establish protection for the living. The only exception are the young Thai of the latest generation who live in large cities. This portion of the Thai population is the first to ignore this tradition.